It’s the One Room Challenge again, a chance for interior designers and bloggers to transform a room in 6 weeks. What I like about this event is how it motivating and inspiring to tackle a project along with everyone else – plus having the deadline helps get it done. The last time I did a project in our house was Fall 2017 when I did a board & batten nursery/boys’ room. This time I am doing a small project and something that is long overdue — our master bathroom. Since it’s been almost 5 years since we’ve lived here and we’re not planning a renovation I want to improve what we have by doing a few small projects so that we can enjoy this space. This is how our vanity originally looked and it stayed this way for 3 years until I painted and changed the hardware. There is a post about the process here. For minimal effort and materials, this made a huge improvement and gave me the hope that I could improve this bathroom without a renovation. The One Room Challenge is now done and it’s time to see the finished spaces for all participants. There were a lot of changes in our home during these past 7 weeks, especially with the addition of our newest family member who was born 3 weeks ago. Completing this room by myself while being very pregnant and then with a newborn had its challenges. I was able to install the Metrie trim but I didn’t have enough time to paint the bunk beds — I may have been a bit unrealistic about what I could complete during this time! The foundation of the room is finished with the new trim, casings, baseboards and new light fixture. With the board and batten on the walls, the ceiling seems higher and these formerly blank white walls have interest even though one side of the room is currently bare. Remember how this wall looked before when it was just plain white and had narrow baseboards? See the difference now? This is the side where the bunk beds will go. In the meantime, here is a clear view of the new, Wide Baseboards and Solid Pine Lattice that I used for the board and batten. It was a new challenge to change the baseboards and I’m so glad I did because it gives the whole room a more updated look. What I learned from installing wide baseboards is that you need a large blade on your mitre saw in order to properly cut them. That’s just something to keep in mind when choosing a saw if you like the wider moulding profiles. 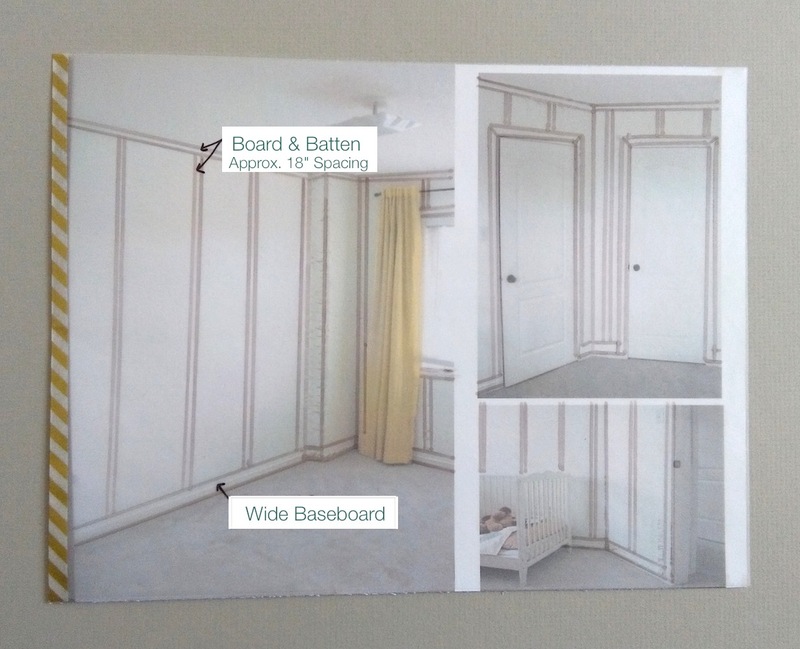 The board and batten worked well with the awkward angles of this room. For artwork, I used this painting that was done by my husband and just happened to be the right colour scheme for the room. While mum was visiting in October she made this flannel crib sheet. Here is my 3-week old son testing out the new space and of course our dog, Cali is right there beside him. Thank you to Metrie for helping to make this vision a reality! I love when a sketch or an idea comes to fruition. Even though many elements in the room stayed the same (curtains, curtain rod, crib) with a new foundation the whole room looks new. To see how all of the other 200 + rooms turned out click on the ORC logo below. It’s week 4 of the One Room Challenge and our baby was born this morning! Even though this room isn’t perfectly finished it doesn’t matter because we have a bassinet in our room to use for the first couple of months anyway. Another announcement is that I am partnering with Metrie to change these plain white walls into ones with more substance thanks to board and batten moulding. Below is the rest of my mood board for the room. After adding moulding in other rooms of the house, I have seen the sense of character it adds and envisioned it here as well. Since this room is an irregular shaped kids room that will be packed with furniture, the board and batten painted white will add some subtle dimension to the walls. This image from Rethink Design Studio is the inspiration and I intend to do a similar style. I like how they used the lattice along the top edge instead of crown moulding. After installing moulding on our staircase this should be a simple job. This is the rough idea of what I’m planning. After doing some sketching and spending time in the room measuring different spacing, I prefer the look the board and batten being wider. That’s it for this week…time to get back to that baby! More updates from the other participants can be found below. Lighting has been the biggest change in this room so far. I finally replaced the builder basic light with a statement one. Since the rest of the room is going to be mainly white and yellow I wanted to create a focal point with the light fixture. My plan was to use this bucket style pendant light and adjust the length to the shortest I could possibly make it. This is what the light looked like with the original long cord and below are photos of it in the room after it had been shortened. Since this was the only change made to the room since last week, here’s a view of the light from all different angles. A reminder of what the room looked like before. This weekend we’re planning to buy a secondhand bunk bed. I’ve been searching for one for months without luck so hopefully this one works out! If not, we aren’t in a huge rush which helps when you’re looking for a specific secondhand piece. Progress in other rooms from the One Room Challenge can be seen here in One Room Challenge Week 3. It’s Week 2 of the Fall One Room Challenge and just over 1 week away from the new baby’s due date. 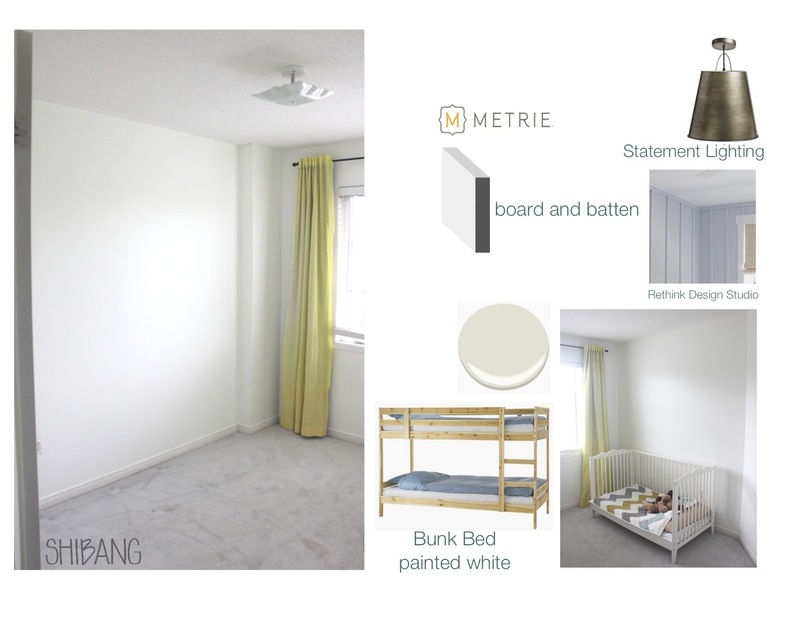 Here’s a look at the plan I have for this shared nursery/bedroom – a neutral base with white walls, furniture & bedding; a statement light fixture and colourful accents that can be changed up over time. Initially, I had planned to colour block the walls with navy on the bottom of the wall to contrast with the white furniture. When my husband saw how dark the navy was, he was completely opposed to this plan so I ended up painting the walls solid white instead. I still think that the navy would have looked good because this is a bright, South facing room but I like the white too. The furniture and curtains in this room are the original pieces that I used in our very first nursery from our Montreal home. This rocking chair was among the first furniture we bought and I below is the original photo of it from October 2012. At that time I was expecting our first child and was keen to paint everything with Annie Sloan Chalk Paint, that’s where my love of DIY home improvement began. The white paint from 5 years ago has stood up very well as you can see in the photo below. The mirror resting in the photo below is the same one that we have in our powder room. Here’s the plain white room which isn’t too exciting right now. After painting the room I realized that I need to make the doors and trim a brighter white so that there is some slight contrast between them and the walls. By the way, these black door handles are actually shiny brass hiding beneath spray paint. It has been three years since I spray painted these and they’re holding up well here because we don’t use these door handles very often. Week 2 from all of the other participants is linked up through Calling it Home. Here’s a brief photo guide showing how I made these cedar planters and lattice. The construction was quite straight-forward, especially making the boxes. The cedar boards were cut to my measurements at Home Depot so when I brought the pieces home they were ready to assemble. The outer boards are cedar decking and the inside supports are spruce 2″x2″s. First, I assembled the front and back sides before adding on the ends. These were so large that I could fit inside the planters as I put them together. I chose to stain the boxes and lattice pieces for a modern look. This is an opaque stain and it took two coats to get even coverage. The lattice is made of pine 2″x 2″s and 2″x3″s for the outer frame. Using these gave me the flexibility to choose my own spacing for the lattice grid plus they could fit in my car when a 4’x8′ sheet of premade lattice wouldn’t be able to. Once the boxes were positioned, I attached two panels to connect the planters and create the illusion of a box around the dogwood shrub that is already planted. After Staining the pieces for the lattice I began to assemble them right beside the planters so that I wouldn’t have to walk very far carrying the screen once it was built. I predrilled holes and used deck screws to attach the pieces. To make it more manageable to install I made one large screen first, attached it to the fence in a few spots and then filled in the sides with the smaller portions. My friend gave me a hand lifting the large screen into place and holding it and the rest I was able to do alone. To line up the side portion of the lattice, I made a basic frame and then added the horizontal pieces to match up with the existing grid. Once the planter boxes were in place and the lattice was complete I lined the boxes with landscaping fabric and then filled them with soil. I packed these boxes with kale this year and have put some spring bulbs in as well. Once winter comes, I plan to fill the planters with boughs and branches – these are perfect for multi-season use. To look back on more photos from the progress and plans for this project below are links to previous posts. Here is the final reveal of the planter box and lattice that I built for the One Room Challenge. In the boxes I planted several types of kale since I know that they grow well in this spot and will provide us with steady greens into September. There are also 4 clematis plants to grow up the lattice and vinca vines to spill down the front of the boxes. Here’s a reminder of what the fence looked like before. Now is the part that I love, watching the vines fill up the lattice and having a constant supply of leafy greens for the next few months. The Before & After of this project is also on Apartment Therapy. The 6 weeks of the One Room Challenge are over now and it’s time for the final reveal. My reveal is going to be a two-part post because I’m not quite done building and we were still having frost warnings last week so I’ll be waiting to plant. The planters are currently in place but in the photo above I drew in the lattice since it’s not done yet. This was some prep work along the fenceline where the raised beds will be going. Since they’re open on the bottom I dug up the grass where the boxes will be sitting. Constructing the boxes was so smooth and quick but staining them and the lattice strips have taken much longer than I had anticipated. Here is the 14 feet of raised planters in place in the garden. This space already feels more organized and expansive with the black boxes. The lattice is coming together and I hope to have it installed within the next 2 weeks. Since it is 8 feet tall I need a hand putting it in place plus there is still more lattice that needs to be stained. In the meantime, by propping up some wood it gives me an idea of the space will look once the full screen is installed. Before & After: Plants and Privacy, What More Could a Backyard Need? To see how the other One Room Challenges turned out click here for the final reveals. It’s incredible to see how much changed in such a short time.